I was inspired to paint my nails a cute, pastel rainbow after spotting bloggy friend Carly's multi-coloured pastel look on Instagram. All I can say is, why have I not done this before? Rather than have to decide on one colour you can pick five (or even ten) of your favourites- genuis! I did both hands the same, but if I can find ten shades that look good together I might do every nail differently next time. I did two coats of each polish for full opacity, being pastel colours they're all a tad streaky but I think that's to be expected with lighter coloured nail polish. Although I liked it as it was I decided to go with Revlon's Nail Enamel in Stunning as a glitter top coat to tie everything together. I think the trick to getting this multi coloured look just right is to choose shades with a similar finish, as Essie's 'We're in it Together' has a bit of a shimmery sheen to it I used that for the thumb (although if you're using a glitter top coat you can probably get away with using slightly different finishes). I know this manicure won't be for everyone but I have to say I like it a whole lot, and if you come anywhere near me today you can be sure I'll be shoving these in your face saying 'look look, aren't they pretty!' (sorry). 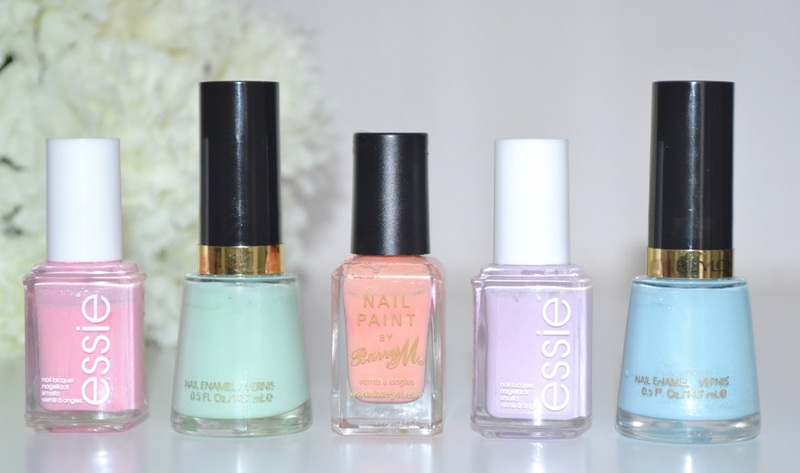 It's the perfect solution when you can't decide what shade to go for, and if you can't have a pastel rainbow on your nails on a lovely spring day like today then when can you?! 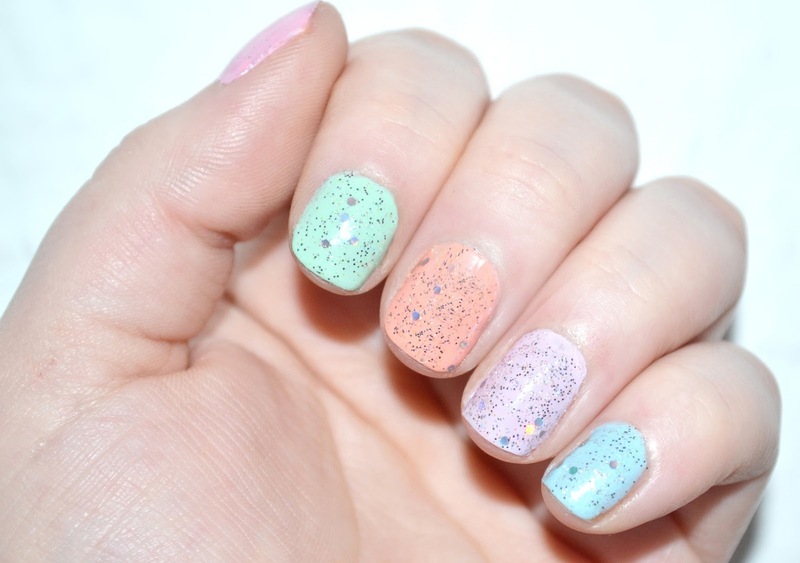 What are your favourite pastel polishes? This is such a cute look! I love the Essie; bond with whomever! great rainbow you ve realized! Thank you for this lovely NA! The Essie Bond with whomever looks so so lovely! I was looking for a similar shade but now I think I will go for this one! I didn't think I would like the peach one at all, but I do think thats my favourite! 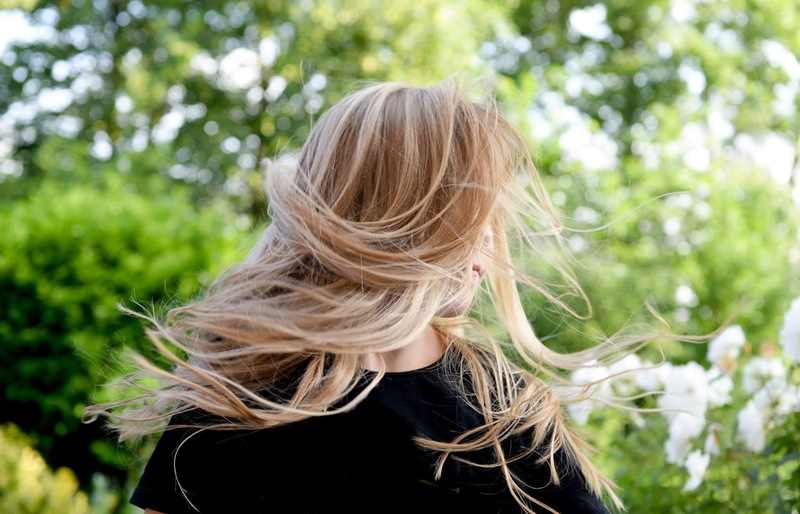 Jamie-Lee|Glitter Infatuation Beauty & Lifestyle Blog! I love the Essie polishes. They are beautiful.